I hear you but 2019 production continues so I doubt its actually planned production but one never knows! Porsche are the masters of demand. Great data. Keep it coming. i take it this is just finished production cars, not customer delivered cars/sales? 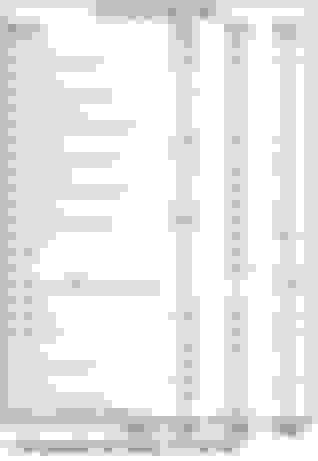 When is this data current through, 1-16-19? do you have this same data for PCL cars as well? Im seeing about 1,320 3RS, 1,100 2RS and 2,850 GT3 for NA so far. Is CarreraT now over 1k built for NA? Last edited by Dot23RS; 01-20-2019 at 05:37 PM. What about the GT3 Touring broken out. What are the US numbers on the GT3Touring? ~600 in NA as of now, estimated we’ll end up with around 800 total or ~25% of 991.2 GT3’s. yes, as of early December. should end up around ~725 GT3Touring in USA and ~100 in Canada. there is not 77 pending Touring builds for Canada ... the 4 largest dealers (90% of the volume) have only 10 pending cars to delivery ... where are you getting your numbers ?? we shall see. I would be surprised if there are less then 750 NA GT3Touring produced when its all said and done. 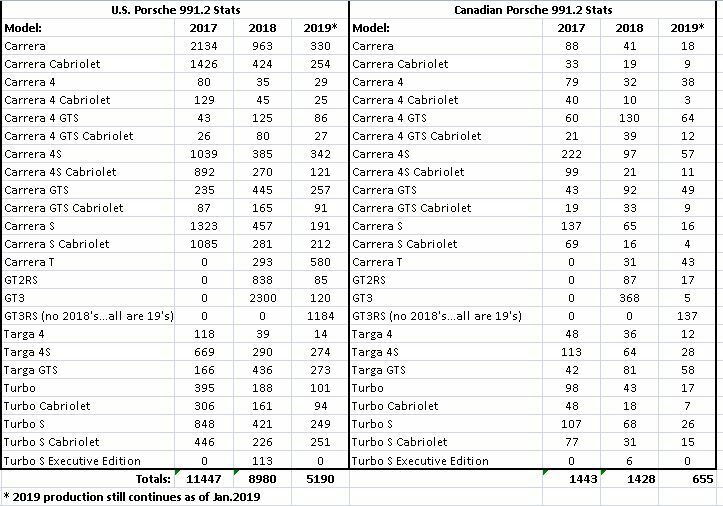 Maybe Canada take rate will be much lower then usual but based on historical sales data and even 911R Canada will end up with 70+ cars. It will be nice to see Ryantt’s updated numbers for base gt3. Last edited by Dot23RS; 01-20-2019 at 07:07 PM. No problem! I have easy access to the stats and don't mind doing it more for personal/morbid curiosity. Plus I feel there are so many people who spout off on half-truths and thought of the day opinions where I know there's no basis. 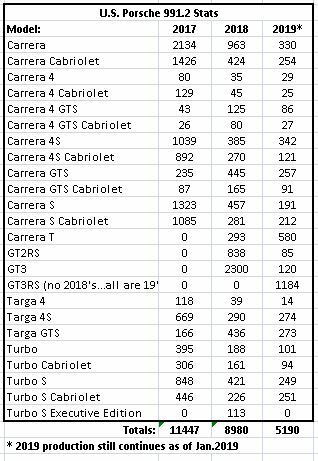 Carrera T is sitting at 939 cars for North America as of today (January 20, 2019). These numbers are actual production numbers and may not be delivered cars as they could be on route, sitting in dealers inventory, etc. awesome. As of today I have 1,183 3RS for USA and 137 for Canada. will be interesting to compare your official 991.2 production numbers against official N.A. 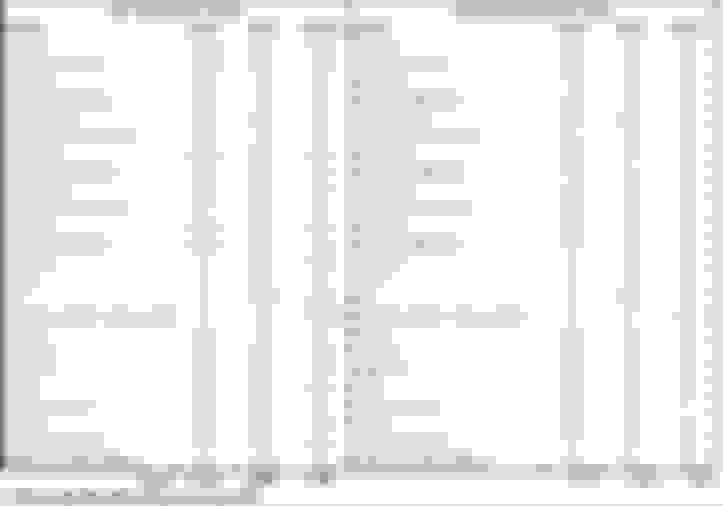 sales data. Do you have the same for 991.1 as well? Completed NA 991.2 GT production to date. Hi guys, does any body knows when is the GT3 production officially closed? Thanks for all the data!